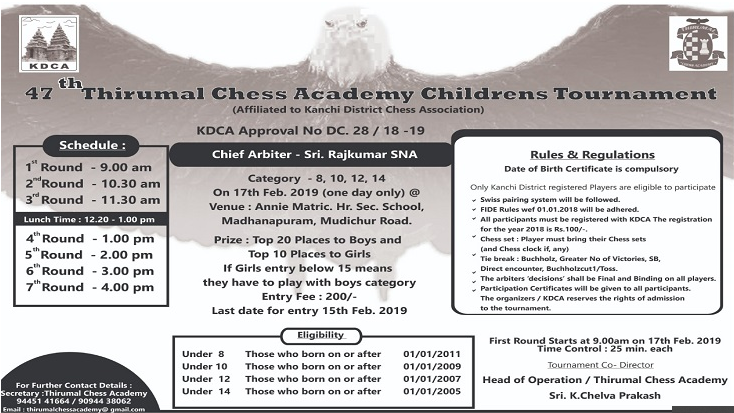 47th Thirumal Chess Academy Childrens Tournament | Sports, -Chess Contest at Tambaram. Only Kanchi District Registered Players are eligible to participate. Swiss pairing system will be followed. FIDE rules wef 01.01.2018 will be adhered. Chess Set: Players must bring their chess sets(chess clock,if any). Tie Break : Buchholz ,Greater No of victories,SB.Direst encounter,Buchholzcut1/toss. The arbiters decisions will be final and binding on all players. Participation certificate will be given to all the participants. The organisers/KDCA reserves the right of admission to the tournament.